LinkedIn, the social network for professionals with over 380 million members, is working hard to bring its brand and its platform into the 21st century to make it more relevant to how people do business today. As part of that, company CEO Jeff Weiner — who happens to also be the company’s head of product — previewed a new version of its flagship mobile application today. Code-named Project Voyager, the new app could be going live in a matter of weeks, he said. The first section Weiner described was, fittingly, Home. 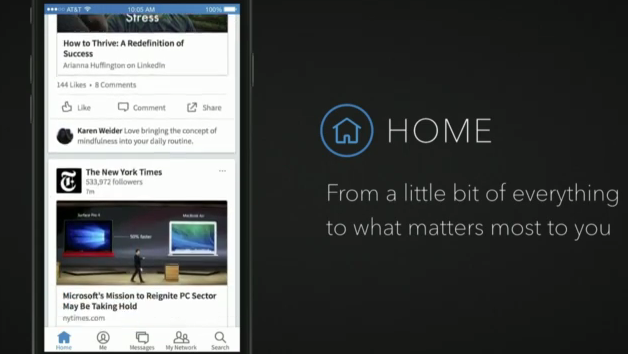 Home, he said, will be a seamless onboarding process, where the app will be able to weed out what you are interested in and what you are not. This will essentially be a rebuilt news feed where people can click on news items but also “discard” those that are less interesting, he noted. “We don’t just want the feed to be about information and news,” Weiner said. It will also include conversation threads and will sort them according to whether people are in your network and how much you communicate with them. 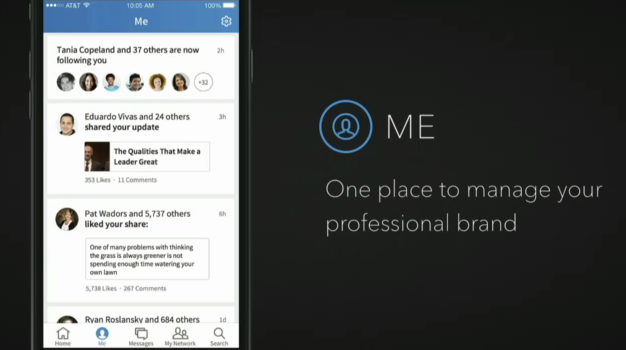 The next feature, Me, will be a kind of notifications center, “a dashboard experience” where LinkedIn will provide analytics about how much your profile is viewed and who is tagging you or reading your content. There seem to be big plans for Me. Weiner hinted that it could be looked at as a way of managing your “whole” professional life, which theoretically could bring in work correspondence or other software. Me is also where you can manage your profile. The third new area, Messaging, Weiner noted, is “clearly the medium where people prefer communicating. Welcome to the 21st century, LinkedIn!” He joked. This is a pretty revolutionary area for LinkedIn, where it is trying to lighten up a little with more human features, such as stickers. “The inbox is out and messaging is in,” Weiner noted. It’s similar to LinkedIn’s Connect features that essentially push contact information to you on the go when people are in your vicinity, and here it will focus first on areas like pre-meeting updates after you’e synced your calendar to the app. “I can get information before a meeting, but I can also ask for information in real time,” he said. This is also where connection requests will be hosted. Search will be another key part of the new app. The experience, Weiner said, will be 300% faster than LinkedIn’s current search experience. “We’re playing a game to see how few letters we can put in before we get the answers to our searches,” he said. The concept here seems to be implementing some AI into the process, tracking what kinds of things you’re already looking at in LinkedIn (and perhaps elsewhere) and using that to anticipate what it is that you will want to look for in the search window. This will also include an entirely new and very dynamic set of search results, containing features like videos, and the ability for businesses to customize how their search results appear. Finally there will be an app launcher incorporated into the experience, using LinkedIn to link out to other apps like Lynda.com more seamlessly. This is an example of how deep linking technology is now becoming ever more mainstream, with the feature eventually being able not only to link you to an app, but to a specific section within it. (For example, a particular lesson or training in LinkedIn rather than the app’s main landing page.) “Over time the launcher will get more intelligent,” Weiner said. More generally, LinkedIn has been making a lot of efforts to expand its profile globally, which has led it to some interesting partnerships such as a deal with Didi Kuaidi, the “Uber” of China. Today Weiner was very focused on his concept of the “economic graph,” which seems to grow in ambition every time I hear it mentioned.